The New York Culinary Experience celebrated its 6th anniversary in 2014. Luxury Experience celebrated its 3rd anniversary attending this annual one-weekend only, 2-day "culinary camp for foodies." With over 33 participating chefs offering master cooking classes providing attendees with the opportunity to experience 4 classes with renowned chefs over the course of 2 days, it should have been difficult to select only 4 classes. 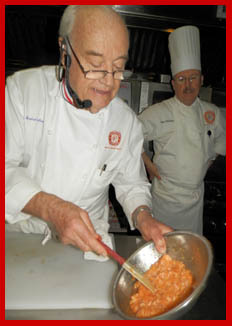 However, for me, the choice was very easy; I knew that I wanted to take a class with Chef André Soltner, Dean of The International Culinary Center, and former Chef-Owner of the legendary New York French restaurant, Lutèce for 34 years. Very few restaurants can achieve legendary status, Lutèce, was one such restaurant, and although I never had the opportunity to dine there under Chef André Soltner's reign, (1961 until he sold it in the mid 1990's), I remember reading about it and hearing the restaurant's name spoken with a hushed reverence from the mouths of foodies. In today's world of restaurant revolving doors, with enthusiastic openings followed by quick closings, it is indeed remarkable that Lutèce was able to maintain its staying power for 34 years, earning the restaurant and Chef André Soltner numerous awards including a four-star rating from The New York Times. I had heard that part of the restaurant's success was not only due to his incredible talent in the kitchen, but also in part due to his dedication, and that of his wife's, to making their clientele's experience memorable. He was a culinary "rock star" before there was such a thing, coming out of the kitchen and greeting his guests. 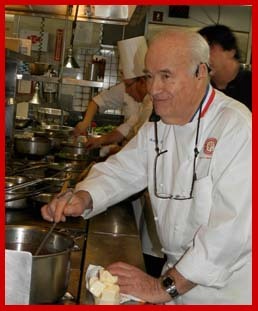 Chef André Soltner has received more than 25 awards in his career including the French government's prestigious Légion d'honneur and Officier du Mérite National, the James Beard Foundation Lifetime Achievement Award, the Meilleur Ouvrier de France, and the Chevalier du Mérite Agricole, to name but a few. 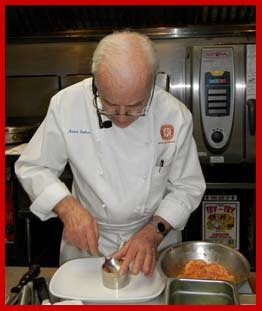 He joined The International Culinary Center in 1995. Watching, learning, and cooking alongside this dynamo born in Alsace, France who has retained his charming accent, I learned that he is the quintessential master chef as well as instructor. He has the ability to translate his passion, dedication, and skill to encourage those he teaches, whether they are a novice or more experienced. He taught the class by telling stories about the background of the recipes, and also about his life growing up in Alsace France, where depending on the politics of the time, was either French or German. 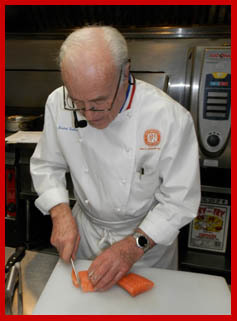 Having stood over a stove for more than 65 years since his apprenticeship at the Hôtel du Parc in Mullhouse, France he still enjoys what he does, cooking, and sharing his passion. Chef André Soltner graciously shares a delicious taste from the class with his recipe for Tartare de Saumon with Sauce Gribiche. Chef André Soltner writes, "I was already working in America, but the first time I ever saw this dish, I was in Paris, at the Brasserie Flore. I think they made it exactly like beef tartare, which is usually called steak tartare, except made with salmon instead of beef. When I returned to New York, I tried it that way. Then I tried adding some raw salmon to smoked salmon and steaming it a little. I liked it much better. All the other ingredients are what you find in most steak tartare recipes." Method: Remove any fat from the salmon, then cut into large pieces. 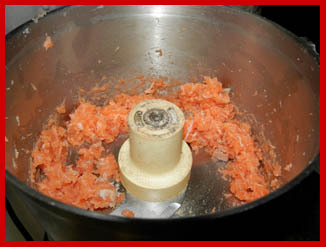 Put the fillet of salmon in a food processor and process in short bursts until the salmon is coarsely chopped. Put the salmon in a bowl. In a vegetable steamer, steam the smoked salmon for 3 minutes, covered. Flake the smoked salmon into small pieces, and add it to the bowl. With a wooden spoon, gently mix the smoked salmon and the fresh salmon. Then gently mix in the salt, pepper, oil, egg yolks, Tabasco, and half of the onion. Arrange the lettuce leaves on 8 plates. Divide the salmon mixture into 8 portions, place each portion in a ring mold and place it the center of each plate. 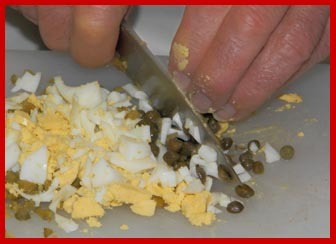 Unmold the salmon, and garnish with the remaining chopped onion and with the chopped hardboiled egg. Note: This dish may also be served as an "amuse-bouche" on triangles of buttered toast. Caution: This recipe uses raw egg yolks, so there is a risk of salmonella contamination. Please use only farm-fresh eggs that have been kept refrigerated. This precaution notwithstanding, you prepare this recipe at your own risk. Method: With a wooden spatula, gently mix all the ingredients. 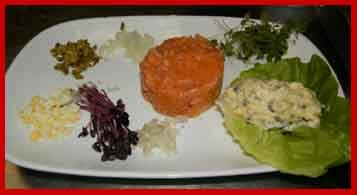 Serve with Tartare de Saumon. Read about this class, and about the other classes in the Gastronomy section and interviews and recipes from the other classes in the Chefs' Recipes section. For information on attending The New York Culinary Experience 2015, please visit the New York magazine website: www.NYmag.com. © April 2014. Luxury Experience. www.LuxuryExperience.com. All rights reserved.